Last time we learned how cavitation degrades a centrifugal pump’s performance by restricting and reducing the water flow at the pump’s inlet where these destructive bubbles are formed. Today we’ll see that despite the fact these cavitation bubbles return to a liquid water state further along in the pump’s high pressure section when they implode, the water flow within the pump remains the same. This is true because of the engineering principle of continuity, which holds that the water flow rate within a pump or any other closed system remains the same throughout that system. What goes in must come out. Continuity has to do with the rate of water flowing through pipes, valves, and pumps within a plumbing system. As water flows through a centrifugal pump, its flow rate is measured as the volume of water that moves past a certain point in the pump per unit of time. Suppose for example that during one minute of elapsed time the volume of water flowing through at the inlet point is found to be five gallons. This then becomes the system’s flow rate of 5 gallons per minute. We’ll call this flow rate Q1. 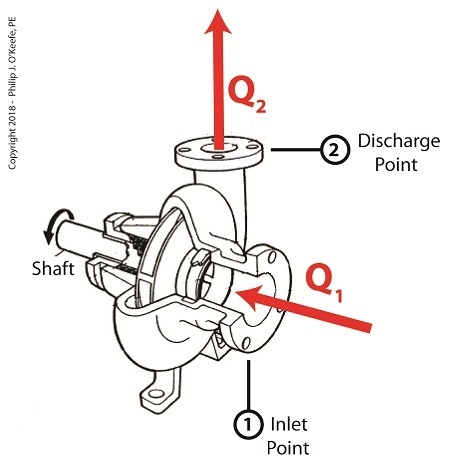 The principle of continuity states that this flow rate Q1 must remain the same throughout the pump. If this were not true, any observed difference in water volume would mean water is somehow either lost or created between the pump’s inlet and discharge. This is an impossibility if the pump is an intact enclosed system, absent any other inlet points or leaks. So according to the principle of continuity, Q1 must equal Q2, the flow rate at pump discharge. When cavitation occurs at the pump’s inlet, Q1, these steam bubbles restrict water flowing into the pump. Although these bubbles will later implode and return to a liquid water state further along the pump system, this change will not affect the flow rate of the water within the pump. The flow rate established at intake will remain the same at pump discharge, Q2. Next time we’ll see how cavitation in centrifugal pumps can be prevented.